Yeastar TG Series VoIP GSM Gateways connect GSM or WCDMA or 4G LTE to VoIP networks to provide two-way communication: GSM/3G/4G to VoIP and VoIP to GSM/3G/4G. 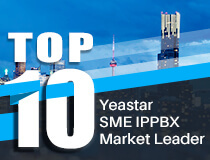 This allows you to connect most IP-based telephone systems including Yeastar IP Phone Systems, and softswitches to a GSM or 3G WCDMA or 4G LTE; which can provide a sophisticated fallback solution when landlines go down, or be used to increase call traffic capacity by providing additional dial-tone. In this article, we explain how to use only one TG GSM Gateway and IP Phone or softphone to realize seamless incoming and outgoing mobile call. Step 1. Create a sip account in TG VoIP GSM Gateway. Go to “Gateway -- VoIP Settings -- VoIP Trunk”. Click “Add VoIP Trunk” and Choose “Account” for “Trunk Type”. Type the “Name”, “Account”, “Password” to create this sip account, then register it in an IP Phone or Softphone. Set the Route from GSM1 to the SIP Account you just build. Set the Route from the SIP Account to GSM1. Then you will be able to use your registered SIP account for calling outside or receiving calls. I have followed these instructions but I'm having issues with receiving calls. Outbound calls work just fine but for incoming calls, callers hear 1 ring-back tone, and then dial tone, and that stays without anything happening. This is being used with a Xorcom PBX, which is based on asterisk. I also need to mention that I am not detecting any attempt to communicate with the PBX, via CLI on the PBX. Typically, I will see the messages for call processing, etc. So for now, I think the issue is solely based on the Yeastar YST-TG200. Any pointers in the right direction will be greatly appreciated as I like your product and would like to see it working properly.